The definitive, authoritative history of the Royal New Zealand Engineers describes the corps' actions, events and people from the New Zealand Wars of the 19th century to the present day. It includes military engineering in New Zealand, including that of Maori, the corps' role in ... read full description below. This authoritative history of the Royal New Zealand Engineers offers a comprehensive account of the corps' actions, events and personnel from the New Zealand Wars of the 19th century to the present. It examines military engineering in New Zealand, the corps' role in overseas wars and home defences, and provides a contemporary record of New Zealand's contribution to military engineering, including demining operations, peacekeeping and civil aid missions. Won by the Spade carries underlying themes of military innovation and engineering's contribution to national development. In New Zealand's context military engineering played a key role in building infrastructure in an otherwise undeveloped country. The warfare in the North Island saw military engineers do this utility work until the 1870s, when peace prevailed. Military roads and communication corridors aided military success and opened up the country. Similarly, the electric telegraph hemmed in rebellious tribes as effectively as weapons. Thereafter a tradition developed of citizen sappers taking their civil experience into the military and, after several overseas wars, bring the experience back to developmental roles in civic, transport, utility and industrial sectors. With about 40 per cent of early European settlers in technological occupations, theirs was going to be a society which took to military engineering well. And it did. 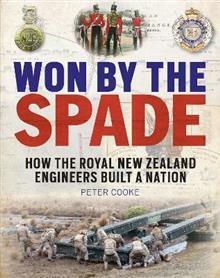 Peter Cooke specialises in New Zealand military history and industrial heritage, having written a dozen books to date. He edits two NZ military history periodicals, lobbies for defence heritage sites under threat and runs field trips to local battle sites. He lives in central Wellington.